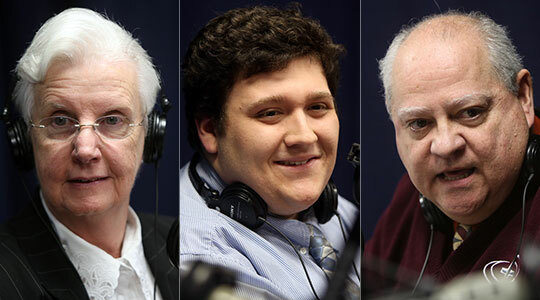 Summary of today’s show: Continuing Catholic Schools Week, Scot Landry and Fr. Matt Williams welcome Sr. Mary Murphy, Fred Gilfeather and Nicholas Fernari from Notre Dame Cristo Rey High School in Lawrence to talk about the unique Cristo Rey model and their success in Massachusetts’ poorest city. The students at the school spend four days per week in class and the fifth day at good jobs in corporate environments, earning money for tuition but also gaining valuable workplace experience well ahead of their peers. The model works as evidenced by a college retention rate that’s twice the national average. 1st segment: Scot Landry welcomed everyone to the show. He noted that this week is Catholic Schools Week. Today’s profile will be Notre Dame Cristo Rey High School in Lawrence which follows the Cristo Rey educational model. But first he welcomed Fr. Matt back to the show after he went to the March for Life last week. He said this March was the best they’ve ever done with over 500 middle schoolers, high schoolers, and young adults. Fr. Matt said he is a product of Catholic schools his entire life. He said his vocation is partly attributed to his Catholic schooling, especially the powerful witness of the priests and sisters he’s know along the way. 2nd segment: Scot welcomed Sr. Mary Murphy, the president of the school; Fred Gilfeather, director of corporate development; and Nicholas Fernari, a junior. Sr. Mary said the school is in Lawrence to serve the people of Lawrence and the model is that students work one day per week to earn tuition and at the same time to gain corporate work experience. It is keyed in on serving people with limited income. It originated in 1996 in Chicago. The Sisters of Notre Dame were invited to be part of the network in 2003. Since then the high school has graduated more than 190. While the majority of students come from Lawrence, they come from surrounding towns. They have 293 students and will cap population to 400. Nicholas said he chose Notre Dame because both his parents value education and grew up a Catholic. He said he many choices for high school, but he chose Notre Dame for the corporate work-study program. This was completely different from what other Catholic high schools offered. He said there’s something you can get from the workplace that you can’t get in the classroom and those skills are useful in the classroom. His freshman year he worked in a small consulting agency with engineers and scientists. He spent most of his time doing filing and other smaller tasks. For the past two years he’s been working at a paralegal firm. Nicholas said he’s leaning toward education. He knows he doesn’t want to be a lawyer after having experienced the profession. Fred said Nick is representative of the student population. He said he’s trying to get a well-rounded basis of what the students are passionate about so he can match them with the right corporate experience. They have medical technology, manufacturing, and the whole gamut of industries. His biggest challenge is to find every student the perfect job. When he knows what they’re passionate, he can try to put them in a job at which they’ll be successful. Scot asked what’s in it for the corporations? Fred said he often connects with someone in the company who believes in what they’re doing and they run it up the ladder. The companies get a good, reliable worker, while the school gets a funding source. The companies also get the satisfaction of helping low-income students from the city of Lawrence, not through a handout but through an opportunity. Scot asked about job-sharing. Sr. Mary said when they talk to companies, they ask them where their needs are. In most cases, it’s not job-sharing, but they do specific jobs. Nick said he’s learned how to be a team member and to realize that if you create a problem, you have to be part of the solution. That’s improved his ability to be part of the school. He’s also learned organizational skills, how to file, how to navigate a workplace. Scot asked Sr. Mary how they prepare the students for the professional poise and work habits. She said they have a training session in the summer for incoming freshman, to educate them about what a supervisor is, what is a performance review; how to respond to others. The students are always afraid on their first day, but universally they are accepted and treated as equals. The school monitors their performance in the workplace each day. Nick said his classmates are generally four years ahead of their peers in knowing what it’s like to be in the business world, which is very different from working in the fast food restaurant or supermarket. Fred said the biggest misconception to overcome is doubts about what a 14-year-old can do for their commpany and he will relate the list of big-name companies hiring these kids, which helps to convince. When the companies meet the kids and how focused they are because these kids know they need to do a good job to stay in school, they understand. The kids are not doing make-work jobs. They’re doing real important work. Fred talked about one company that saw such a return on their investment with students providing translation services that they’re adding even more translators from among students next year. Fr. Matt asked about the witness. Sr. Mary said they talk about the core values and try to live it. The students also evangelize their peers. Employers universally talk about how the students exemplify the best values. Sr. Mary said they’re not just trying to get the students into college. They follow them for six years to make sure they finish college. It’s education for life. their hope is that when times are tough, that the faith life they support becomes more important. She said Notre Dame Cristo Rey is making a difference in Lawrence and families often tell her that the school is their hope to get out of poverty. Sr. Mary said the Cristo Rey Network has partnered with colleges, helping students who can’t afford tuition. Most of their students tend to stay locally. Scot asked Nicholas how he would differentiate a Cristo Rey student from students at other schools. Nicholas said they all have a good sense of the language of business which contributes to their professionalism. Sr. Mary said the lives of students outside school can be chaotic, and the school offers them something to hold onto, something stable, something that helps with their resiliency. 3rd segment: Scot asked Fred what are the coolest jobs. Fred said he thinks the coolest is at New England BioLabs in Ipswich. the company has a rain forest inside the building that they use to purify all the water that the building uses. Another is NuPath which provides day services and residential options for adults in need. She said some students even go on their own time to volunteer. They also discussed the distances the students will have to travel for their jobs. Fred said they transport all their students to their jobs, which contributes to a very high attendance rate. Even for those who miss a day, they have to make it up during vacation or another day. Fr. Matt asked Nick about how they make up for the one day per week they spend at their jobs. He said their school day is longer and so is their school year. The school day is 8am to 3:30pm. He said they are in school from the end of August to the middle of June. Sr. Mary said the school has sports, but they’re not intent on being in the top tiers. They have basketball and cross-country and have had softball and baseball teams. But practice and game schedules have to be adapted to class and work schedules. She said the school is sponsored by the Sisters of Notre Dame de Namur and so they ensure the Sisters’ charism is carried through. They have a staff person who deals with the Catholic identity of the school, not just in religion classes, but throughout everything the school does. They have a strong religion program that is tied into the directives from the Cristo Rey Network. They have school Masses with the Augustinian friars serving the local parish, St. Mary of the Assumption. They have retreats through campus ministry. Seventy-three percent of students are Catholic and the parish is one of the largest Hispanic Catholic communities in the Archdiocese. For companies or organizations in the Merrimack Valley interested in partnering with Notre Dame Cristo Rey, Fred said he wants them to know that these students are very focused. If you need one student or four or 26, they can help with that. He tells them that the companies change people’s lives from day one. He encouraged companies to call him and come by for a tour. Fred said the national average retention rate through sophomore year for Latino students in college is 43 percentage. Notre Dame has an 86 percent retention rate.